Everyone's got that special conservative in their life. Maybe it's your dad, who forwards you every chain email about the President's birth certificate, or your neighbor, who just put up a Mitt Romney sign. Dealing with these folks can be ... frustrating. This holiday season, we're giving you a chance to have a little bit of fun at their expense. 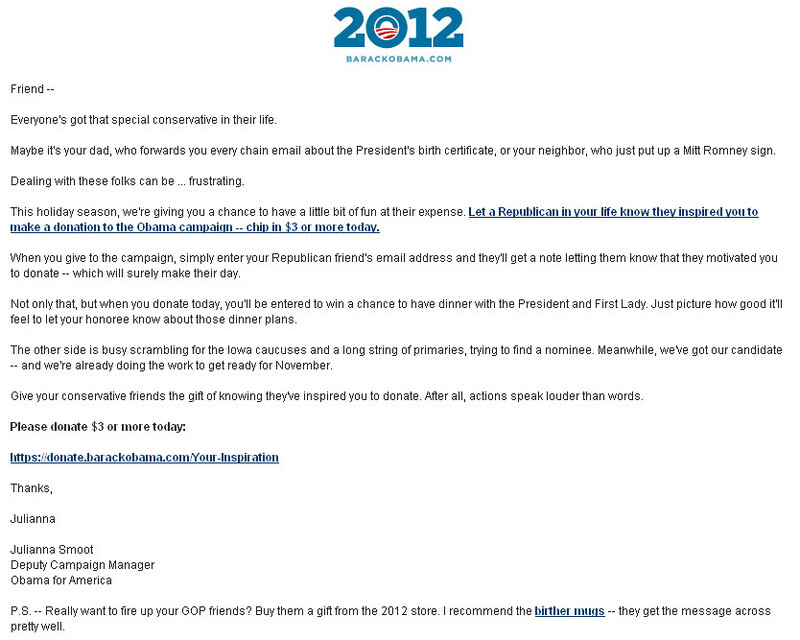 Let a Republican in your life know they inspired you to make a donation to the Obama campaign -- chip in $3 or more today. When you give to the campaign, simply enter your Republican friend's email address and they'll get a note letting them know that they motivated you to donate -- which will surely make their day. Give your conservative friends the gift of knowing they've inspired you to donate. After all, actions speak louder than words. P.S. -- Really want to fire up your GOP friends? Buy them a gift from the 2012 store. I recommend the birther mugs -- they get the message across pretty well. Even on Christmas, Obama wants supporters to find conservatives and "get in their faces."